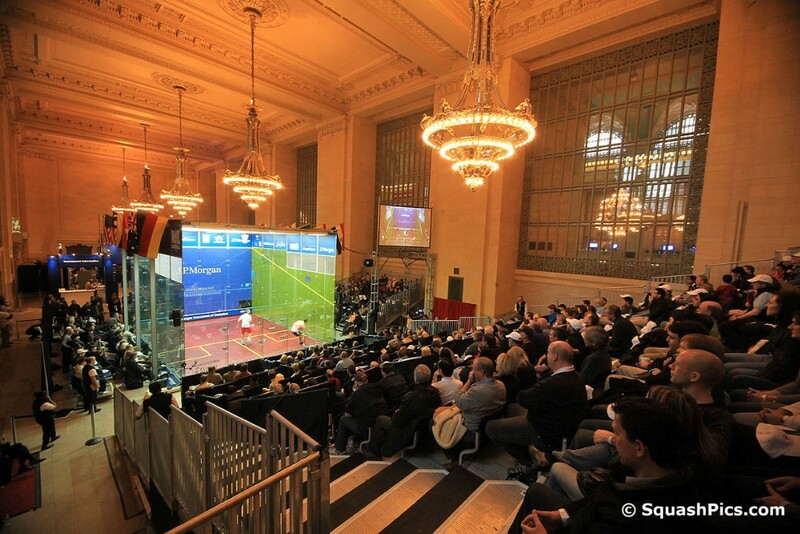 Egyptian teenager Marwan El Shorbagy became the first qualifier to make the quarter-finals of the JP Morgan Tournament of Champions for ten years after defeating England’s Tom Richards in the second round of the first PSA World Series squash event of the year at Grand Central Terminal in New York. 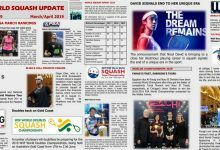 The 18-year-old’s celebrations were boosted later when his older brother Mohamed El Shorbagy, the No7 seed, also made the last eight. 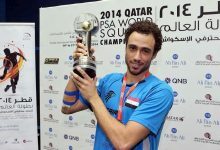 “This is one of the happiest days for the El Shorbagy family,” said 21-year-old Mohamed minutes after his five-game victory over Australia’s Cameron Pilley. 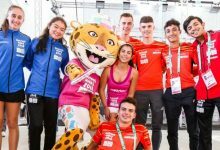 Marwan, the 18-year-old reigning world junior champion, continued his fearless trek through the talent-laden Tournament of Champions draw as he knocked off Richards, ranked 20 in the world, by winning a 12-10 nail-biting fifth game. The older brother’s advice was to play a basic game, but at the same time, look for every opportunity to attack. The first game was a seesaw with Richards grabbing an early 7-4 lead and El Shorbagy then forging ahead 8-7 before Richards edged out an 11-9 win. 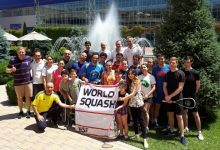 Although the Englishman took an early lead in the second, the young Egyptian stormed back and scored nine unanswered points to win the game and level the match. The third game saw Richards back in command as he surged to an 8-3 lead, winning the game 11-7. 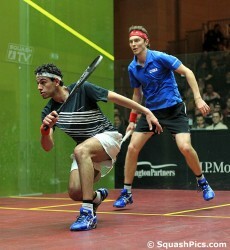 The momentum shifted back to El Shorbagy in the fourth when he took the lead at 3-2 and never relinquished it. El Shorbagy again took an early lead in the fifth. Down 4-7, the 25-year-old from Surrey was not ready to surrender and evened the match at seven-all. 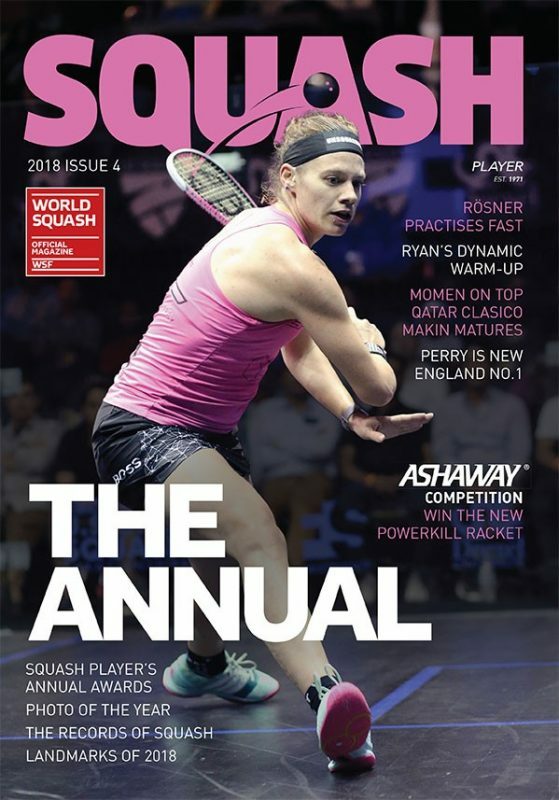 El Shorbagy won the next point and Richards evened the score again – the pattern was repeated three times until El Shorbagy took the last and final lead at 11-10 and won the game 12-10. 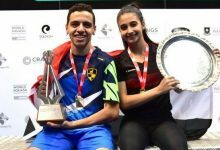 For the fast-rising Egyptian teenager it was another exultant moment on the glass court in Grand Central Terminal – the first one having occurred two days earlier when he beat eighth seed Thierry Lincou, the former world No1 from France. All this after having to be persuaded by his brother to even enter the iconic championship which is a favourite of the PSA Tour players. 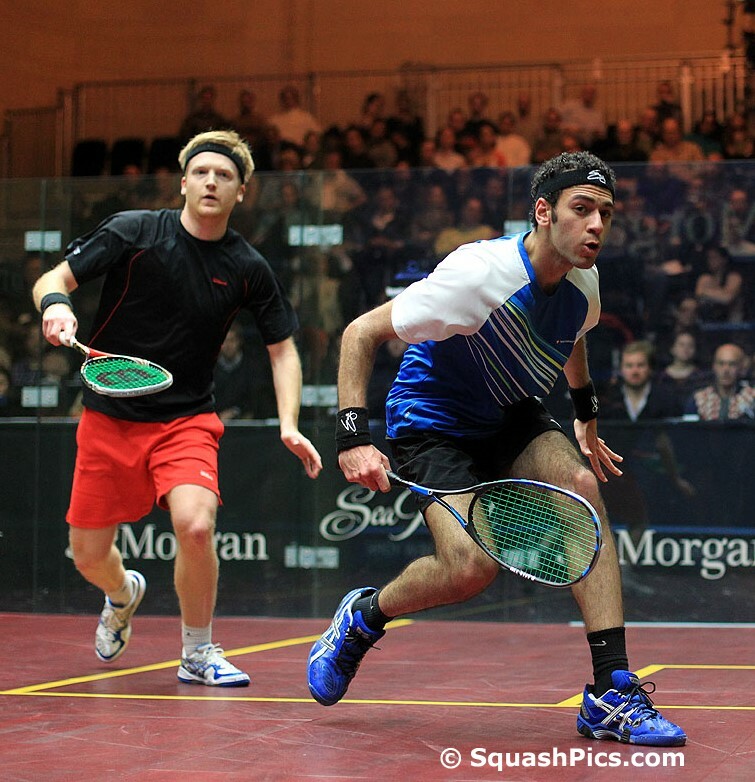 Just a couple of hours later, it was El Shorbagy senior’s turn to make some magic on court. “Marwan’s match inspired me, but it also took a lot out of me,” said Mohamed. 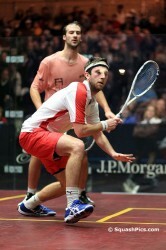 Like his brother, he went the distance against Australian Pilley, an opponent whom he finds especially difficult to play. 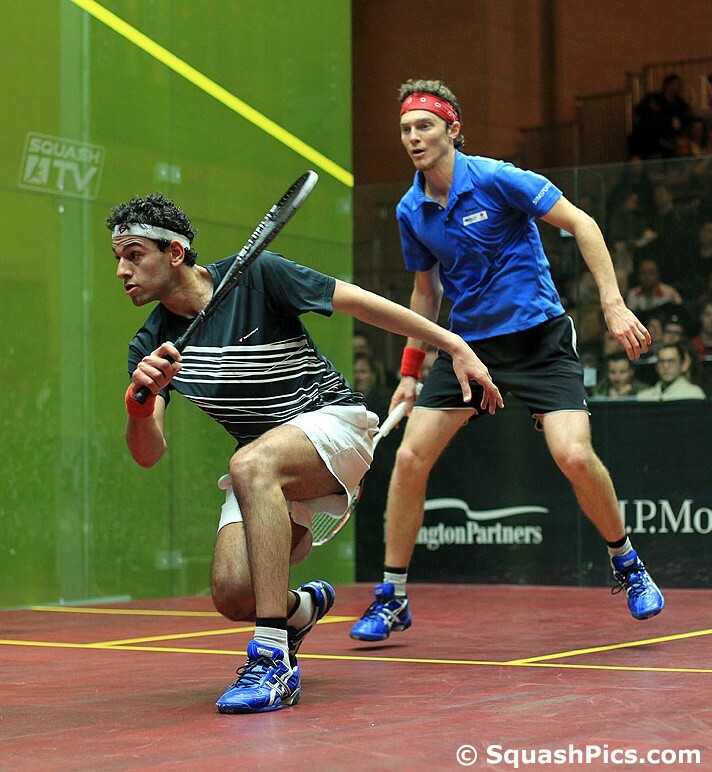 “This was an up and down match,” said El Shorbagy. “Sometime I was playing super, and sometimes like an 11-year-old.” Fortunately for the Egyptian, he was super in the fifth, jumping out to a 9-2 lead and winning the decider 11-5. The older El Shorbagy’s quarter-final opponent will be England’s Nick Matthew. 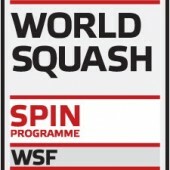 The top seed eliminated Adrian Grant, hisCommonwealth Games gold medallist doubles partner, in three games. The younger El Shorbagy’s last eight opponent will be Daryl Selby, who defeated Germany’s Simon Rosner in four games. The match almost went to five games when Rosner came back from a 5-10 deficit to earn a game ball at 11-10. An ill-considered attempt at a cross court backhand drop from deep in the court resulted in a tin to tie the game and Selby took advantage to finish the match. 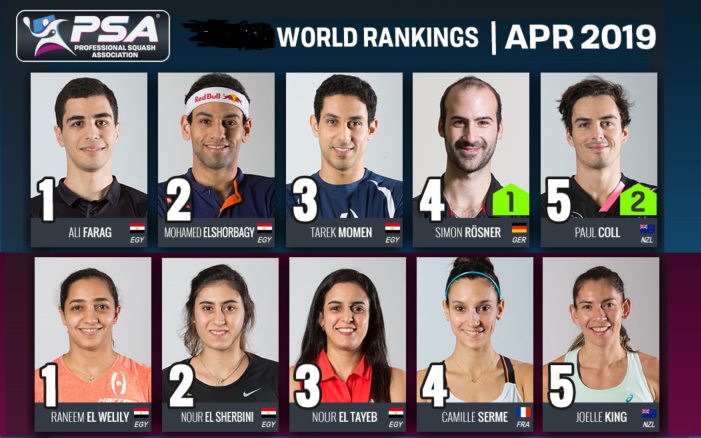 Rounding out the trio of Egyptian squash players into the quarterfinals is two-time title-holder Amr Shabana, whose match with Miguel Angel Rodriguez was the most entertaining and dramatic of the day. Once again, the Colombian qualifier thrilled the crowd with his speed and acrobatic style of play while Shabana’s ability to hit a winning nick at the most opportune times left the spectators in the capacity crowd shaking their heads in amazement on several occasions. 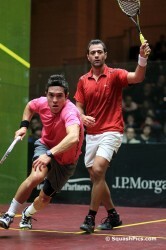 Shabana seemed to have control of the match when he took a 2/0 lead after winning the first two games 11-6, 11-8. But the never-say-die Rodriguez was unfazed and won the third game 11-7. The fourth game was all Rodriguez as he jumped out to a 9-3 lead and won the game 11-4. The change in strategy worked – after trading the lead back and forth several times in the early part of the fifth game, Shabana asserted himself at seven-all by hitting a service return winner into the nick. 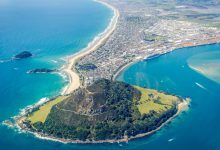 He then patiently kept the ball tight to the wall until he had an opening to attack – even so, it was nearly impossible to hit a shot that the speedy South American could not reach. Shabana surged ahead to 10-7 and at 10-8, hit the ball to every corner of the court. His opponent covered all the corners and thrilled the crowd by hitting a shot from behind his back and then one through his legs before a deep cross court from Shabana was just enough out of reach to force a game-winning racquet error. Shabana’s quarter-final match will pit two of the game’s best shot-makers against each other as he takes on Gregory Gaultier in a repeat of this month’s ATCO PSA World Series Finals final in London. “I was worried that I would get off to a slow start after having to wait so long to play,” said the Frenchman, referring to the fact that he got on court at 10pm – one and a half hours after his scheduled match, due to several lengthy matches earlier in the day. “But I actually started quickly,” said the world No3. 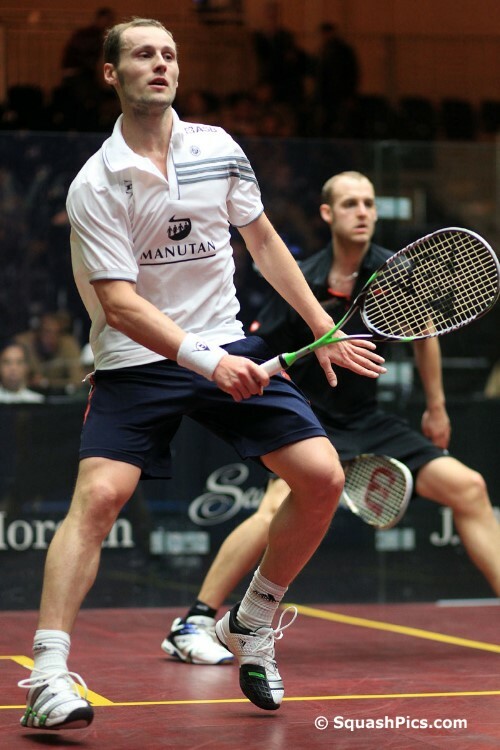 After winning the first game 11-4, Gaultier lost concentration and dropped the second game to Swiss opponent Nicolas Mueller. The third and fourth games were entirely in the Frenchman’s control – he was never behind in either game. 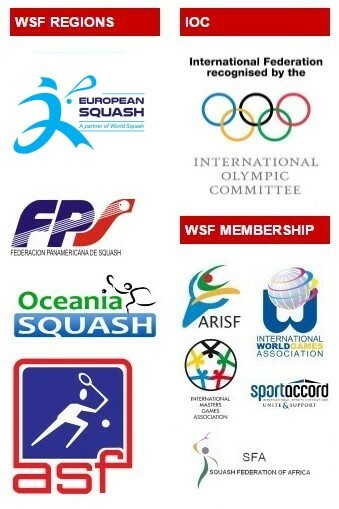 The final quarter-final pairing will be a contest between two Englishmen, each of whom won their matches in three games. 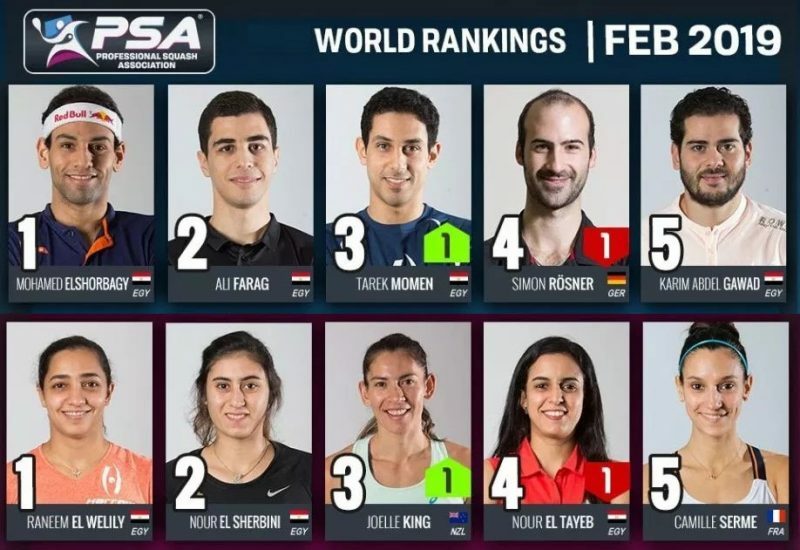 World No1 and second seed James Willstrop despatched Egyptian qualifier Mohammed Abbas while sixth seed Peter Barker eliminated Canadian Shahier Razik.